I don’t know about all of you, but I love the Spring time. I love the warmer weather and the gorgeous colors of Spring. I have an adorable seasonal snack to share whose container is even cuter. 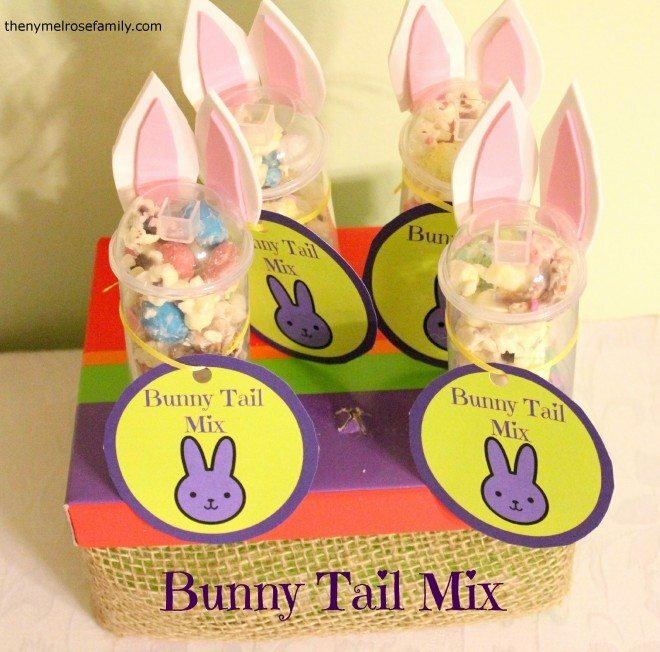 I’m sure you’ve heard of Trail Mix before, but have you heard of Bunny Tail Mix? I hadn’t and let me tell you it is addicting! Salty and sweet, all in one delightful bite size snack. This looks yummy and adorable! The perfect packaging for little friends! Thanks for sharing!!! Thanks so much Tabby. Riley loved making it too. Looks so good! Such a creative idea with the bunny tail and ears on the push pops!!! The popcorn sounds amazing too! Thanks so much Rachel! You are too sweet. Aww! Thanks so much Cami. OMG!!! This is just tooooo cute! You must be the most popular mom in town! Awww so cute! I bet your kiddos love this. I know mine would. Thanks! Thanks so much Eva. She definitely loved the bunny pops. What a fun idea for little ones– who doesn’t like “push pops” anyway? I love them and like a bunny design– I’m sold! Too cute Jenny! Love these! I got my push pops from Michaels over in the baking aisle. I’m pretty sure they carry them at Hobby Lobby as well. SO SO CUTE! I can’t even stand it. What a fun easter treat. Thanks for linking it up to Monday Funday! So adorable! Gotta get my hands on some of those push pops! Those are so cute … what a fun treat for friends! Riley’s friends at daycare definitely loved them. I like the idea of serving this in the push pops to control portions…. and the bunny ears make it super cute! c’est adorable : merci pour le partage !… je cherche des freebies sur le web et je partage mes liens sur Pinterest : je viens d’y ajouter celui-ci !… http://pinterest.com/lemondedis/ (j’ai déjà plus de 13000 liens vers des téléchargements gratuits !) mais j’ai eu un problème pour télécharger l’imprimable : il est inaccessible d’ici, mais j’ai néanmoins pu l’obtenir à partir du lien sur whatscookingwithruthie.com…. Not to worry Lila. I’m glad you found it! Hugs!